This EBITDA multiple template helps you find out the EBITDA multiple given the line items for determining the enterprise value. 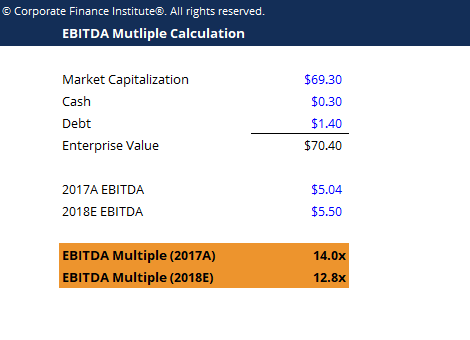 The EBITDA multiple is a financial ratio that compares a company’s Enterprise Value to its annual EBITDA (which can be either a historical figure or a forecast/estimate). This multiple is used to determine the value of a company and compare it to the value of other, similar businesses. A company’s EBITDA multiple provides a normalized ratio for differences in capital structure, taxation, fixed assets, and for comparing disparities of operations in various companies. The ratio takes a company’s enterprise value (which represents market capitalizationMarket CapitalizationMarket Capitalization (Market Cap) is the most recent market value of a company’s outstanding shares. Market Cap is equal to the current share price multiplied by the number of shares outstanding. The investing community often uses the market capitalization value to rank companies plus net debt) and compares it to the Earnings Before InterestInterest ExpenseInterest expense arises out of a company that finances through debt or capital leases. Interest is found in the income statement, but can also be calculated through the debt schedule. The schedule should outline all the major pieces of debt a company has on its balance sheet, and calculate interest by multiplying the, TaxesTax ShieldA Tax Shield is an allowable deduction from taxable income that results in a reduction of taxes owed. The value of these shields depends on the effective tax rate for the corporation or individual. Common expenses that are deductible include depreciation, amortization, mortgage payments and interest expense, Depreciation, and Amortization (EBITDA) for a given period.